As the weather warms up, I pull my blender from its winter home and give it a prominent place on the kitchen counter. Summer fruits are on the way--beginning with spring strawberries--and many of them will find their way into a refreshingly cold fruit smoothie. Smoothies are a clever way to incorporate healthful foods into the diets of even the pickiest eaters. If your husband or kids don't like the taste of soy, put silken tofu or soy milk into a fruit-laden smoothie to mask the unusual taste and texture of this healthful plant. Tofu is a great source of high quality protein and good fat, as well as phytoestrogens, which may help reduce the risk of some cancers. The range of ingredients you can slip into a smoothie is impressive, and include ground flaxseed, sunflower seeds, avocados, berries, fruit and veggie juices, yogurt, milk or soy milk and wheat germ....and of course just about any fruit under the sun. Try one of these easy recipes, and improvise your own blends all summer long! Blend tofu and pineapple on high speed for 20 seconds, mixing well. Add yogurt, oil, extract, and water. Blend on high for 15 seconds and serve immediately. In blender, whip avocado and milk. Add honey, banana, and mango. Blend on high speed for 10 seconds until smooth. Add peach nectar or juice and blend for 5 seconds. Serve immediately. You do eat breakfast, right? When I'm away from home and can't eat normally, I miss my yummy morning meals more than any other. I always have strong, black tea brewed from loose leaves, some kind of fruit and whole grains in one form or another. This time of year, pink grapefruit is my breakfast fruit of choice, and I also load up my oatmeal or cold cereal with fresh berries, dried cranberries and/or chopped apple. A bowl of whole-grain cereal with calcium-fortified soy milk and some fruit. Add a tablespoon of freshly ground flaxseeds on top as a source of omega-3 fatty acids. A soy shake (blend 1/2 cake silken tofu, 1/2 cup apple juice, 1 cup frozen organic strawberries and 1 banana). Keep some hard boiled eggs (choose free-range, omega-3 fortified eggs) on hand to eat with whole-grain toast. Include a glass of calcium-fortified orange juice and a container of nonfat plain yogurt. Add your own fruit or granola. Doughnuts. High in sugar, trans-fats, calories and refined flour, doughnuts are not only bad for your waistline, but ultimately disastrous for your energy levels as well. The high sugar content is likely to end in a midday energy crash. If you crave a doughnut, try a piece of whole-grain bread with some jam and peanut butter instead. Fast-Food "Breakfast Sandwiches." The combination of low-quality, fried meats, processed cheese, and refined breads adds up to a high-calorie, high-sodium, fat-laden food. A better option is to make a sandwich at home - include whole-grain bread, and low-fat cheese, along with fresh veggies to boost your morning fiber. Sugared Cereal. While different brands vary widely in the amount of added sugars (do your homework and read the labels), sugared cereals should not be a part of your morning routine - or your diet, period. If you crave sweetness, try adding a teaspoon of sugar or stevia to unsweetened whole-grain cereals, or try a bowl of steel-cut oats with some blackstrap molasses, which provides an added dose of calcium. Corn tortillas not only are delicious but they're also healthy. They generally have more fiber and fewer calories than flour ones, and no trans fats. In fact, most tortillas have only two ingredients, a type of cornmeal and water. For supper last night we had these easy to prepare soft tacos--vegetarian (with protein coming mostly from black beans) and easily made vegan if you omit the shredded cheese. Two tacos have fewer than 300 calories, so I could easily afford three. 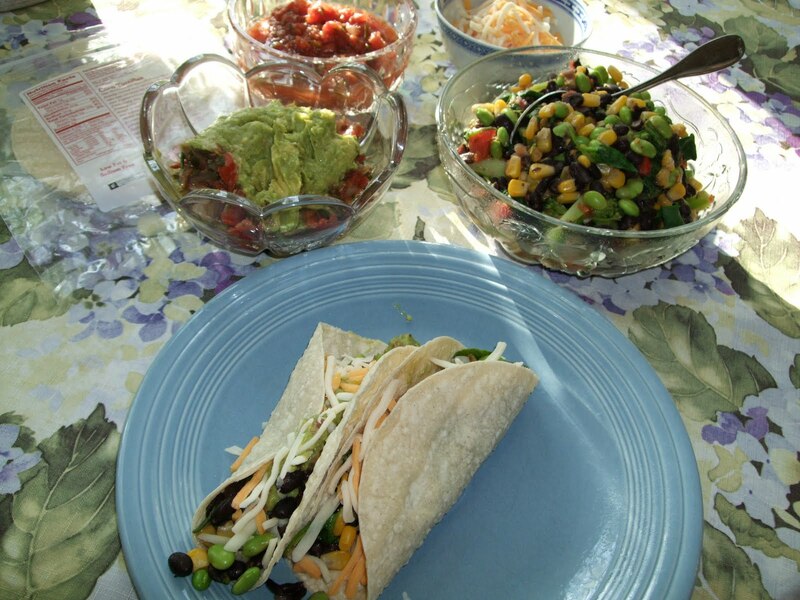 The idea is to make a few veggie dishes and let everyone fill his/her own tacos with what seems most appealing. My main ingredient was a mix of drained black beans, steamed small pieces of broccoli, wilted spinach, corn kernels and chopped red bell peppers. To that, I added a small amount of mild tomato salsa. The extra bowls include more tomato salsa, spicy guacamole with pico de gallo and shredded cheese. Just heat the tortillas for 30 seconds in the microwave and fill 'em up. Sauces make all the difference! If you're not that enamored of the taste of many vegetables, and you really like white bread and white rice better than their whole-grain counterparts, healthy but delicious sauces can give those foods a real boost. 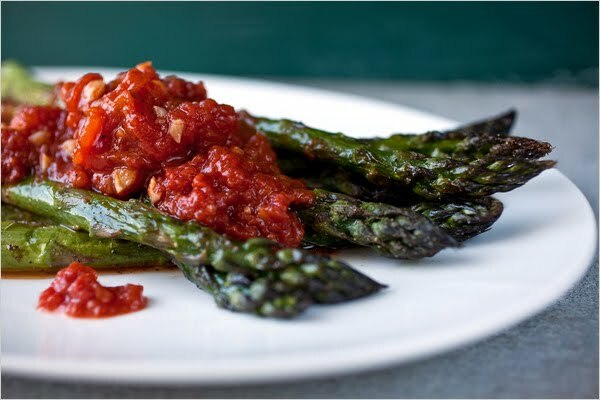 A few days ago on the Health & Nutrition pages of the NY Times, an article ran about how to enhance vegetables and grains with some tasty, easy to make sauces. Click here to go to the article, which includes the recipes. 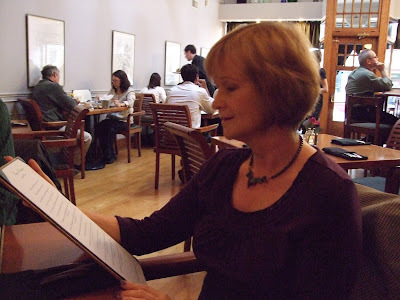 How to avoid "restaurant catastrophes"
Although "cook your food" is an important healthy-foodie principle, I can't deny my love for eating out. 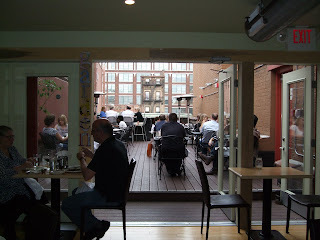 Trying a new restaurant -- or returning to an old fave -- is my idea of a fun evening out. The Real Age website has some interesting ideas for ways to navigate restaurant meals so that you don't have to atone for your foodie sins for days afterward. They suggest that the first 10 minutes and last 10 minutes of your evening out might be the most important in terms of making healthier choices. Here's a summary of their tips. 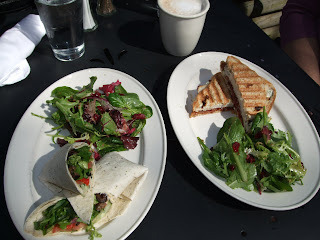 Here's a guest posting from a fellow healthy foodie. Her name is Shannon Wills, and she wanted to share her take on what NOT to eat. 1. Fries: This one finds its way to the top of the list because it’s fried and salted. In short, anything that’s dipped in oil and dripping with oil is a definite no-no. 2. Sodas: They not only add empty calories (zero nutritional value) to your diet, but also contain large amounts of sugar that weaken your immune system. Even the ones that have the word “diet” on them are laden with chemicals. So avoid anything with added sugar or preservatives. 3. Canned goods: When any food item is canned, it’s naturally loaded with preservatives and additives to keep it fresh. 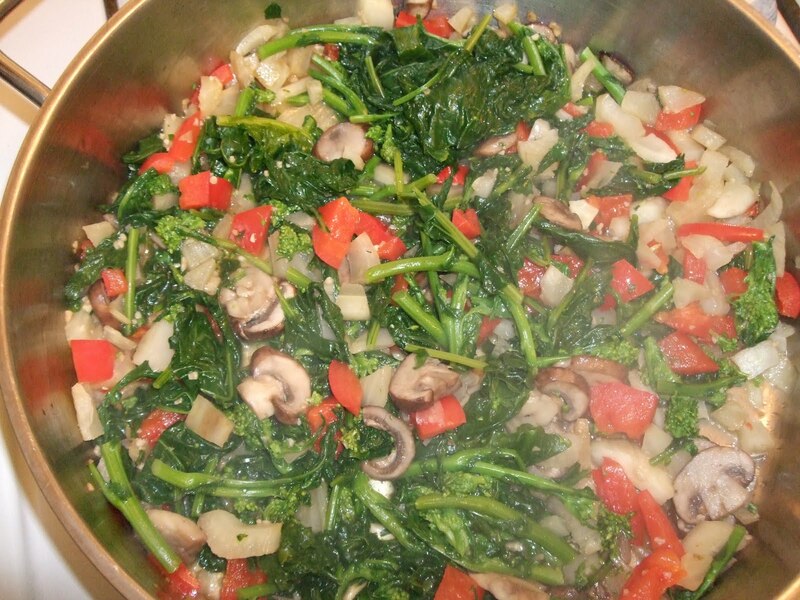 So avoid canned goods as much as you can and prefer to cook using fresh ingredients. 4. Pastries: The main ingredients are refined flour, sugar and hydrogenated fat – need I say more? 5. Dairy products: Although you do need dairy for your calcium requirements, choose healthier options like the low fat variety when it comes to milk, yoghurt and cheese. 6. Fast food: The burgers and pizzas may tempt your taste buds, but if you must have fast food, avoid the cheese, mayo, and the red meat in your bread. Rather, choose to add more onions and tomatoes to your sandwich or burger and ask for the small sized one. 7. Butter: or any fatty spread you like on your bread, like peanut butter and sugary jams are not good for either your waistline or your health. 8. Salty foods: Another food item to avoid like the plague is salt – so potato chips, pretzels and most other snacks are out. While nuts are good, keep away from the salted ones. And avoid alcohol if you have the habit of nibbling on salty snacks while sipping on your drink. 9. Red meat: Beef, venison and other red meats are high in cholesterol and hard to digest. So ask for a chicken or turkey sandwich if you must have one. Also avoid seafood like lobster and crabs because they’re high in cholesterol too. 10. Foods with processed grain: Anything that’s processed too much is not good for you; so that eliminates white rice, pasta and just about any food that’s not made with wholegrain. 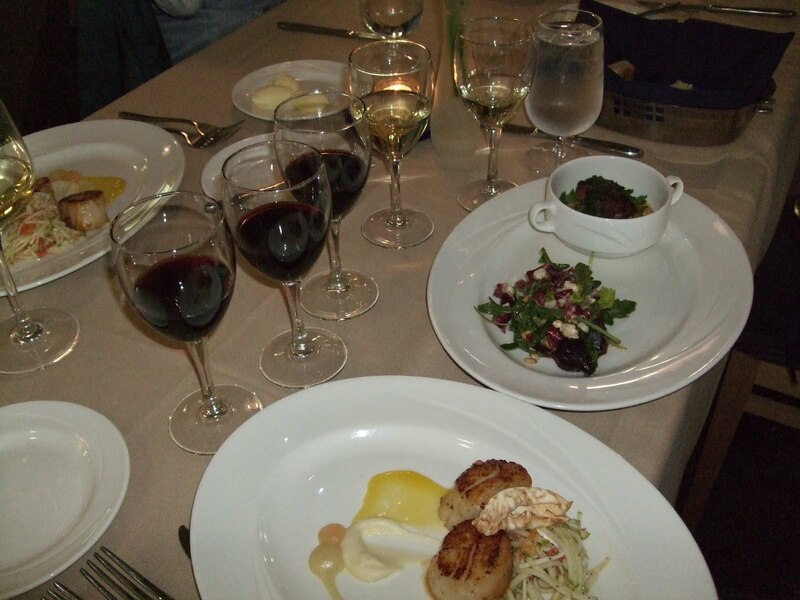 For wine lovers like us, the news for healthy foodies is generally very positive. Most studies point to the overall superiority of red wine over other alcoholic beverages in terms of enhancing our health. The consensus seems to be that in moderation and as part of an overall healthy diet, red wine in particular is good for us. "Thanks to its alcohol content and non-alcoholic phytochemicals (natural occuring plant compounds), wine has been shown to reduce the risk of heart disease, certain cancers, and slow the progression of neurological degenerative disorders like Alzheimer's and Parkinson's Disease." Red wine has the added benefit of containing high concentrations of the powerful heart-protective antioxident resveratol. However, some experts point out that tests of the effects of resveratol have so far been conducted on animals, not humans, so we can't extrapolate too much from the results. And of course, one of my healthy foodie rules to live by is "Minimize liquid calories," so that weight control is another reason to take it easy on wine consumption. Forge your own path through the land of alcohol, and good luck! Here is a lovely recipe from the New York Times' Health & Fitness pages. 1. Cook the squash. Heat half of the olive oil in a large, heavy cast iron or nonstick skillet over medium-high heat. Add half the squash in a single layer. Turn the heat down to medium. Cook five minutes or until the squash is nicely browned on one side; shake the pan to turn the squash or use tongs. Cook for another five to 10 minutes, shaking the pan often or stirring with a wooden spoon, until the squash is nicely browned and tender when pierced by a knife or skewer. Season to taste with salt, and transfer to a bowl. Repeat with the remaining olive oil and squash. 3. Heat the tortillas. Fill the bottom of a steamer with 1/2 inch of water, and bring to a boil. Meanwhile, wrap the tortillas in a heavy kitchen towel, and place in the steamer basket above the boiling water. Cover tightly and steam one minute, then turn off the heat but do not uncover. Let stand for 15 minutes. 4. Pass the hot tortillas, and top with the squash. 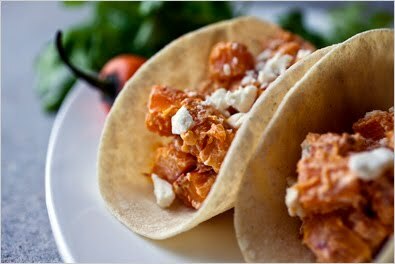 Sprinkle on the queso fresco, fold the tortillas over and enjoy. Yield: Eight tacos, serving four. Advance preparation: The cooked squash will keep for a few days in the refrigerator, without the addition of the yogurt. Reheat on top of the stove or in a microwave, then stir in the yogurt and proceed with the recipe. An organization called Ohioans for Humane Farms is working both to support family farms and to bring an end to inhumane treatment of farm animals. As an aside, note that the Oscar- nominated documentary about our nation's industrial food system, "Food, Inc.", will be shown tonight (Weds 4/21) on PBS. Ohioans for Humane Farms is spearheading a new, citizen-backed ballot initiative to prevent some of the cruelest factory farming practices in Ohio. The measure will require the Ohio Livestock Care Standards Board to adopt certain minimum standards that will prevent animal cruelty, improve health and food safety, support family farms and safeguard the environment throughout the state of Ohio. They're asking for concerned citizens to help gather signatures to put this initiative on the November ballot. It's a good cause, so if you think you might be interested, find out more on their website (www.ohiohumane.com). I'm referring to asparagus -- a marvelous spring treat. Yes, you can get it from the supermarket year-round, but spring is the time when you can get locally grown asparagus. As with so many other foods, the local version is almost like another food altogether from the crops that are shipped thousands of miles before it reaches our tables -- or our mouths. This salad recipe calls for several ingredients that you should be able to find now from local sources. Farmers will have a variety of lettuces now, so use whatever looks most appealing. The first new potatoes ought to be gracing farm stands throughout the area. Try to get garlic shoots—a little harder to find—or substitute local or supermarket chives. Ingredients note: Among the area’s early crops are garlic shoots, also called green garlic. You can’t find them in supermarkets, but only in farmers markets. You can substitute chives, if necessary. For the vinaigrette: In a small bowl, whisk together the vinegar, mustard, honey and olive oil until smooth and creamy. Stir in the green shoots or chives and season with salt and pepper. Set aside. For the salad: Preheat oven to 400 degrees. Spread the asparagus on a lightly oiled baking sheet and drizzle with the olive oil. Add salt and pepper to taste, if desired. Roast in the hot oven for five minutes, stirring once. Remove from oven and let cool slightly. Cut into bite size pieces, about two inches long. Toss the greens with the potatoes, asparagus and pecans. Add vinaigrette to taste and toss well. Arrange on serving plates, spreading strawberries and crumbled cheese over each serving. Pass any extra dressing at the table. This is my favorite fast-food meal -- OK, my only fast-food meal. I either get chicken or the vegetarian version like this one, with guacamole, two kinds of salsa, lettuce and a little cheese. I flew to Tampa this past weekend to visit my brother, Paul, who lives in St Petersburg. The culinary highlight was dinner at the famed Bern's Steakhouse in Tampa. I eat beef maybe a handful of times per year, and theirs was amazing. They also have one of the most extensive and wonderful wine lists in the world. We visited the Salvador Dali museum on the campus of the University of South Florida, and ate at other fun restaurants in downtown St. Pete, including Moon Under Water, a reliable spot with lots of outdoor seating and good food & drink. I'm heading out again later this week for another trip, but hope to get some posting in soon. I think tea is delicious -- especially hearty black teas, made from loose leaves, strong and with milk added. That's my favorite caffeine drink, bar none. Strong, slightly sweetened (with Splenda) iced tea also is a great summer drink, and in the case of iced tea I can handle some fruit flavored additions, such as peach and mango. • Heart health. Population studies have linked tea consumption with a reduced risk of cardiovascular disease. Tea may lower LDL (“bad”) cholesterol and make it less susceptible to artery-damaging oxidation, as well as improve blood vessel functioning, lessen inflammation, and inhibit blood clotting. But not all studies show heart benefits. • Cancer. In lab studies, tea polyphenols have been shown to inhibit various cancers, including colon, bladder, lung, skin, and prostate. Results from human studies, however, are less consistent. Several observational studies in women, for example, have linked tea with reduced risk of ovarian cancer. On the other hand, one review article cited mixed results on tea and lung cancer. • Body weight. There’s some evidence that tea may have a weight-loss effect, though not all studies find this, and any benefit would be modest at best. In a small study a few years ago, oolong and green tea boosted energy expenditure in healthy women. And in a Swiss review, most studies found that green tea reduced body weight and body fat. Tea polyphenols may stimulate energy metabolism and boost fat burning, but part of the effect may also be due to tea’s caffeine. • Bone health. Long-term tea drinkers tend to have greater bone density than non­drinkers, several studies have found. Tea contains fluoride, flavonoids, and other compounds that are good for bones. • The brain. Lab studies support the role of tea in aiding cognition. Studies in people, however, are limited. In one study in 2006, older people who reported drinking as little as four to six cups of green tea a week had a reduced risk of cognitive impairment compared to those who drank less. Though its effects in the body are not fully understood, tea can be a healthy addition to your diet. And all types have something to offer. Without added sugars or milk, tea has negligible calories. But check the labels on bottled and instant teas, since many have lots of added sugar. If you don’t like caffeine, decaffeinated tea is often available. Someone once said that a strawberry is a heart-shaped valentine to the human heart, and there’s plenty of evidence that the gorgeous red berry is one of nature’s superfoods. Strawberries are low in calories, fat free, and are rich in fiber, Vitamin C, folate, potassium and cancer-fighting antioxidants. One study found that regular consumption of strawberries decreases systolic blood pressure and increased blood folate levels, both of which can contribute to heart health. Even though you can find fresh strawberries in supermarkets almost any time, the season for locally grown berries is coming very soon (May and June). And it’s always better to buy produce grown near your home whenever possible. Local berries have traveled a fraction of the distance between farm and table compared to the fruit you find in fall and winter, and it’s easier to find out whether they have been organically farmed—because you can ask the farmer! Two places to buy locally grown berries are Kremer’s Market in Crescent Springs and Madison’s at good old Findlay Market in Cincinnati. When you get these treasures home, wash, hull, cut and sweeten them—unrefined cane sugar (such as Sucanat) helps protect strawberries from mold—and store in an air-tight container in the fridge. Then they’re ready to add to your morning oatmeal or cold cereal, or sprinkle over plain or frozen yogurt. I also love the combination of strawberries and high-quality balsamic vinegar, which actually is surprisingly delicious over ice cream, maybe with the addition of a little cracked black pepper. Sounds weird, but if you are the adventurous type, give it a try. Or use some berries in this salad that combines sweet, sour, bitter, creamy and crunchy flavors in one marvelous springtime treat. Healthy foodies should have a handful of nuts every day, without exception. They are filling, loaded with "good" mononunsaturated fatty acids (MUFA) and taste great, too. An Australian food blogger posted some useful info this week about why almonds might be the best nut of them all. Here are excerpts from her site, www.foodwatch.com.au. What's so special about almonds? Almonds are rich in monounsaturated fats which are good fats to have in your diet. Almonds boast an impressive 66 per cent of their total fat as monounsaturated fat (pretty high - remember olive oil comes in at 75) along with 23 per cent polyunsaturated and only 7 per cent saturated. They load you up with antioxidant vitamin E and an amino acid called arginine, both of which work to keep blood vessels clear of fatty plaques that could otherwise cause blockages. All good news for your heart. Almonds are also a surprisingly good source of calcium. A handful has 70mg calcium, as much as in 1/3 cup of ricotta cheese. They’re packed with other essential nutrients including B vitamins, minerals (think magnesium, zinc and potassium) and protein. How to best enjoy almonds: Eat them whole because the skin is an excellent source of antioxidants known as flavonoids (like those found in tea) and fibre. They’re high in fat – about half their weight is fat, like most nuts.So it's best to make your own portion control packages. That ensures you won’t bolt down industrial-strength quantities in one sitting. On the plus side, they have virtually no carbohydrate and are high in fiber. Studies have shown that dieters tend to lose weight – not put it on – by snacking on almonds between meals. Do you know the best foods to rev up your body before a workout? If you're armed with the right fuel before you hit the trail, or the gym, or whatever you're doing, you'll be able to do the routine with energy to spare. Take this quiz to find out how much you know about eating and exercise. And make sure that your body gets the right balance of carbs, proteins, fats and fluids to make your workout as efficient as possible. One of my favorite healthy-foodie sources, Eating Well magazine, posted this info about a short list of foods that will keep weight off, improve our skin, and make us look and feel great. Here's a summary of the article; for the whole piece, go here. We've been fans of bison burgers for years. Bison (buffalo) has significantly less fat and saturated fat than beef, and thus far at least the production of bison has happened outside of the industrial food system. There's a ranch in Richmond OH -- Vista Grand -- that provides much of the bison available in our market. Whenever we pass through Lexington, KY, we love to stop at Ted's Montana Grill for bison burgers with all the trimmings. They have bison steaks, too, but we've never gone that route. This past weekend, we tried bison fillets from Vista Grand. It was delish! 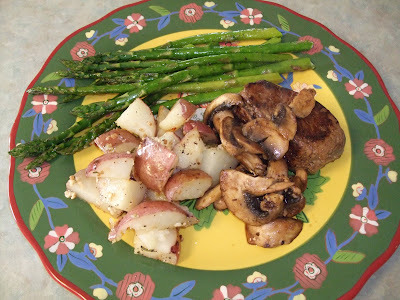 I grilled them, made a simple mushroom/black pepper sauce and served the steaks with roasted red potatoes and grilled asparagus. All that made for one fine Saturday supper at home. We also cracked open a bottle of Super Tuscan wine called Giorgio Primo, hand carried from Florence, IT, on our trip last summer. My husband loves these little critters, although I have not been able to develop much of a taste for them. The canned versions seem kind of icky to me, and despite much searching I haven't been able to find fresh sardines in any market. Nonetheless, they are SO good for us, I'm thinking I ought to try some canned sardines again. I know that Trader Joe's has a few versions, some with mustard sauce and so on. Here's what the Berkeley Wellness Letter posted this week about the health benefits of sardines. All seafood has something good to offer. But sardines (a name given to many small fish in the herring family) are a top choice across the board. Sardines are one of the richest sources of heart-healthy omega-3 fats—richer than canned tuna and many fish oil supplements. And because sardine populations are abundant (after a collapse in the 1950s), environmental groups consider them a good ecological choice. Moreover, contaminants are much less of a concern with sardines than with tuna, swordfish, farmed salmon, and most other fatty fish; you can safely eat sardines at least once a week. • Sardines typically come canned, but more markets now carry them fresh as well. Restaurants often serve them grilled, which is an easy way to prepare them at home. • For convenience, keep a few cans of sardines in your cupboard. With their easy-to-open lids, you can take them to work or on the road for a quick, easy meal or snack. They are good paired with hearty breads or crackers, nuts, olives, cheese, and fruit, or mixed with chopped eggs or beets. • When buying canned sardines, compare nutrition labels. Depending on the type of sardine, where they come from, and what they are packed in (water, oil, or tomato or mustard sauces), they can vary a lot in calories (90 to 350), fat (5 to 30 grams), and sodium (100 to 500 milligrams) per serving. • Canned whole sardines are a good source of calcium if you eat the bones, which are softened during processing. A 3-ounce serving has about as much calcium as a cup of milk. Sardines are also a natural source of vitamin D—165 IU in 3 ounces. More canned news: Besides sardines (and, of course, tuna), many other fish come canned, convenient, and healthy. Consider canned herring (with even more omega-3s than sardines), canned salmon (almost always wild, so contaminants are not a problem, and also a good source of calcium if you eat the bones), and canned mackerel (another great choice for omega-3s and calcium), as well as canned shrimp, oysters, clams, and crabmeat. If you are watching your sodium intake, compare labels to find products with lower amounts. AS OUR MARKET CHEF EXTRAORDINAIRE! and our seasonal catering menu. PLEASE JOIN US ON FACEBOOK FOR UPDATES ON THE GRAND OPENING! 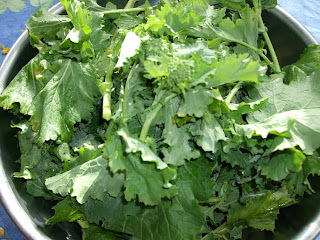 I've been looking for rapini all winter, and finally found some this week at bigg's in Hyde Park/Oakley. It's a cool weather crop, so you might also start seeing rapini -- also called broccoli rabe -- at local farmers markets this spring. I've tried different cooking methods and have settled on coarsely chopping, then blanching the greens and thinner stems very briefly in boiling, salted water before draining well and adding to sauteed aromatic vegetables. For the veggies, I happened to have a half fennel bulb in the fridge, so I chopped and sauteed it with a half red pepper, minced garlic, and about a cup of sliced mushrooms. To serve, I sprinkled with some cheese. This was my dinner, with bread. 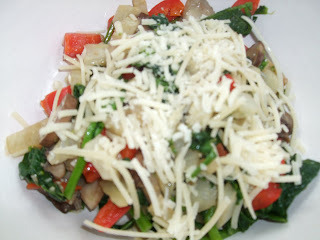 It's also good over pasta or as a side dish with fish or poultry. Tired of the same-old, same-old at breakfast? Check out this array of morning recipe ideas from Epicurious. Included (in photo), fruit and oat muesli, as well as rhubarb/strawberry breakfast crostini, sweet potato cakes with mango-pineapple chutney, and buckwheat crepes, among others. This no-cook oatmeal cereal treat is the easiest to prepare! Mix first 4 ingredients in large bowl. Let stand 5 minutes to soften oats. Whisk orange juice and honey in medium bowl. Stir in grated apples and almonds, then 3 cups chopped fruit. Stir fruit mixture into oat mixture. DO AHEAD: Can be made 8 hours ahead. Cover; chill. Spoon into bowls. Fine-dining fans, don't forget the Summit Restaurant at Cincinnati State, where the Midwest Culinary Institute students help create excellent, seasonal meals three nights a week (Thursday, Friday and Saturday). 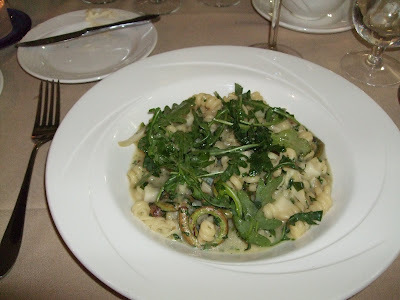 The highlight, food wise, was a fresh, light pasta dish that included fiddlehead ferns (bottom photo), a local delicacy available for just a few weeks in the early spring. Look for them at Findlay Market. We also liked the scallops appetizer (top photo). Desserts were light and yummy. If you haven't tried this restaurant yet....you should! 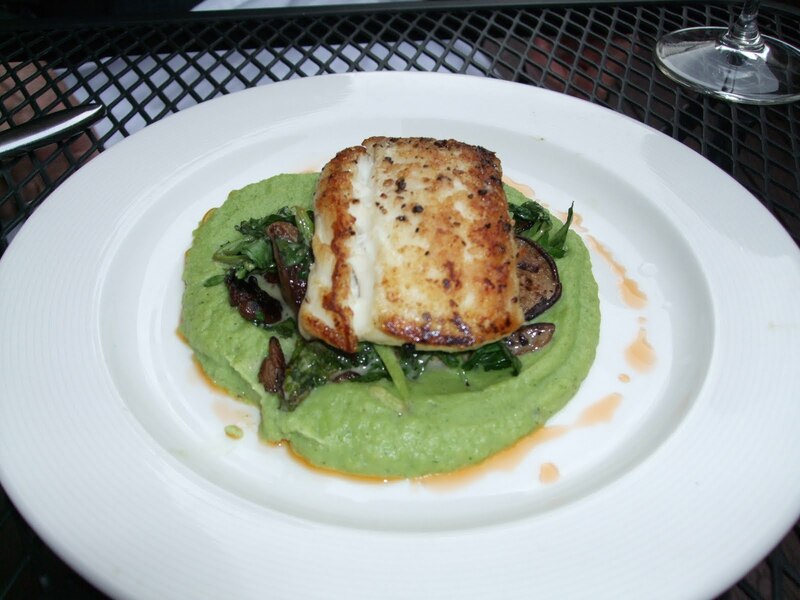 I borrowed this idea from Chef Bernstein at Lavomatic, who placed his halibut over a puree of watercress and (white) potato. We generally prefer sweet potatoes to white ones, so this is the dish I came up with. Place the sweet potatoes in a 2-3 quart saucepan, cover with water and bring to a boil. Cook for about 10 minutes, until potatoes are very tender. Drain and let cool slightly. Add the sweet potatoes and the next 5 ingredients (maple syrup through salt) in the bowl of a food processor and process until smooth. Remove to a bowl, cover with foil and keep warm. Meanwhile, heat a grill or a nonstick frying pan and cook the halibut over moderately high heat, browning each side for 3 minutes per side. Reduce heat to medium, add herbs, cover and cook another 3 minutes. Drizzle lemon juice and olive oil over the fish. 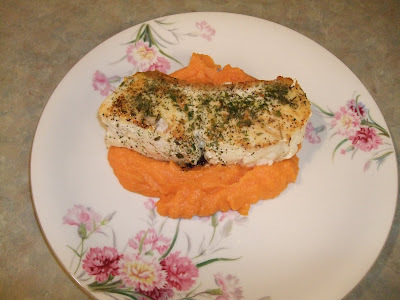 Spoon half the sweet potato puree onto two serving plates and place a halibut fillet over each. Cincinnati Regional Food Congress 2010. It is a day long event aimed at creating an educational forum to communicate about the Cincinnati food system, its programs and practices and vision for a change. Sponsors of this event, held at UC's Community Design Center in Clifton, include the Nutrition Council of Cincinnati, Civic Garden Center, the Center for Closing the Health Gap, and others. Panels include discussions about food policies (state and local), "what it means to be food insecure," promoting local food distribution and urban agriculture. The event includes a catered lunch. For more info, call Food Congress Organizer Clare Norwood, 513-556-3282. 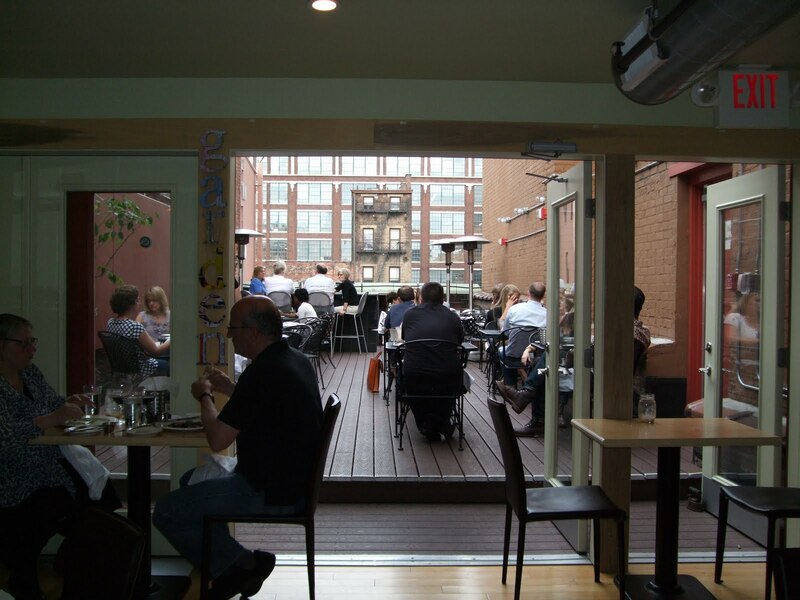 We headed to the Gateway Quarter downtown to kick off our holiday weekend with happy-hour drinks at Senate followed by dinner on the roof at Lavomatic, across the street. Senate is only a few weeks old, and it was just getting cranked up when we arrived near 6 PM. The perfect 75-degree weather made for open the front doors and windows, giving a fresh-air feel to the entire room. It's a small space, but pleasant. We perched at the bar and tried a couple of cocktails while chatting up the bartender and other staffers. When we mentioned that we planned to eat across the street at Lavomatic because the food choices were healthier, the manager comped us his healthy salad ("My Wife's Salad," a light and satisfying mix of arugula--my favorite green--avocado, mozzarella and tiny tomatoes). We promised to return for a meal. At Lavo, we nabbed a table on the rooftop patio and had a grand time. We loved Chef Brad Bernstein's approach to food -- sourcing local ingredients and saucing with a light and healthy touch. Even though we'd had our salad at Senate, I could not resist the grilled romaine with caramelized onions and a delicious, light blue cheese dressing -- I love grilled lettuces. 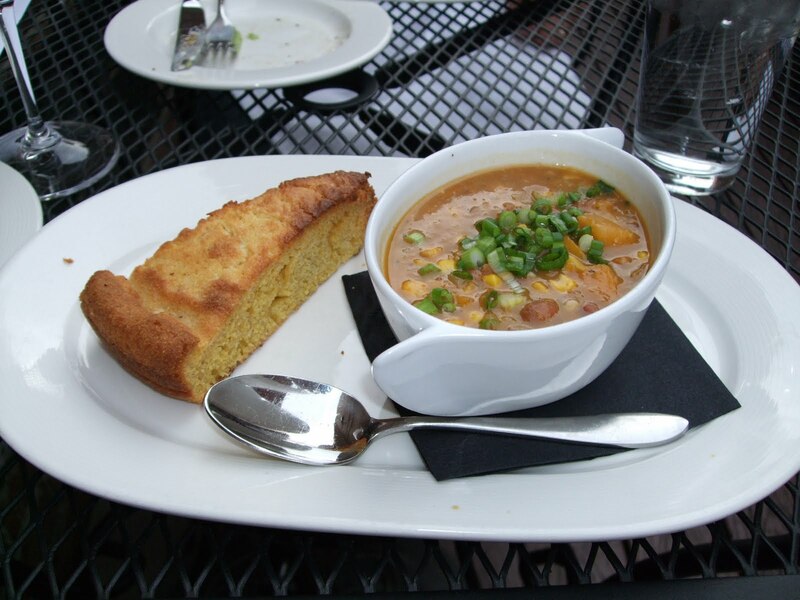 For my main course, I went with Grandma's Bean Stew, a vegan dish accompanied by a hefty slice of skillet cornbread. My husband had a halibut special atop pureed potatoes and watercress--tasty, but a somewhat small portion for his appetite. (I gave him some of my cornbread). With a glass of wine apiece, we were well satisfied and did not try dessert. This is a fun neighborhood with new places opening all the time and lots of young people moving in to the newly renovated condo buildings nearby. We're so happy to see city 'hoods become retvitalized, and encourage adventurous readers to check it out. 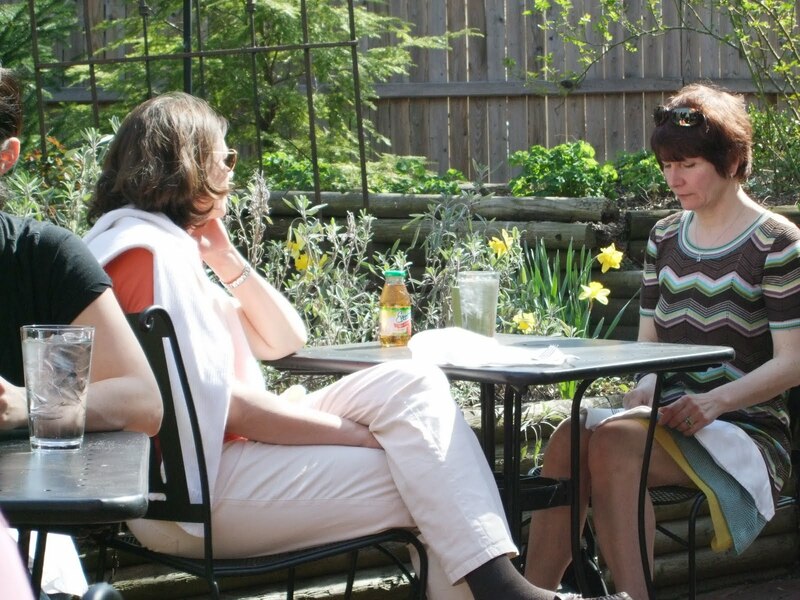 If you want healthy choices -- and less healthy ones -- in a delightful garden setting, head to Greenup Cafe in Covington while the weather is lovely. More details to come........photos show a veggie wrap and the "Covington Hot Brown," a lighter version of the famed Louisville Kentucky Hot Brown sandwich. 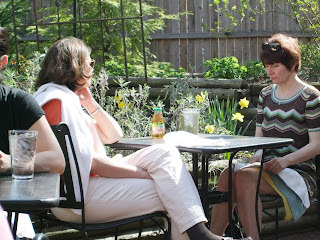 They do Saturday and Sunday brunch, Mimosas included, as well as breakfast/lunch Tuesday - Friday. 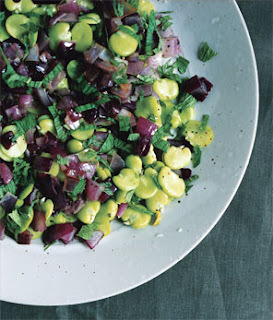 I found this on Epicurious -- it's from a Gourmet magazine article a couple of years ago. I substituted olive oil for butter in the original recipe. Cook shallots in olive oil in a 12-inch heavy skillet over medium heat, stirring frequently, until just tender, about 4 minutes. Stir in asparagus, peas, sea salt, and 1/4 teaspoon pepper, then seal skillet with foil. Cook over medium heat until vegetables are tender but still slightly al dente, about 8 minutes. Stir in basil and sea salt to taste.